Elevation at start: approx. 7,400 ft.
Elevation at finish: approx. 6,250 ft.
Total elevation loss: 1,150 ft. The BMT is designated as a skate race, but a track is set the length of the course and classic and adaptive skiers are welcome. Classic and adaptive skiers are timed as skate competitors. The Boulder Mountain Tour starts near Galena Lodge, 23 miles north of Ketchum on the Senate Meadows loop. The course crosses Highway 75 below Galena Lodge and continues down the Harriman Trail finishing at the SNRA Headquarters. The terrain begins with some moderate but challenging climbs and descents, then becomes more gentle around the halfway point. 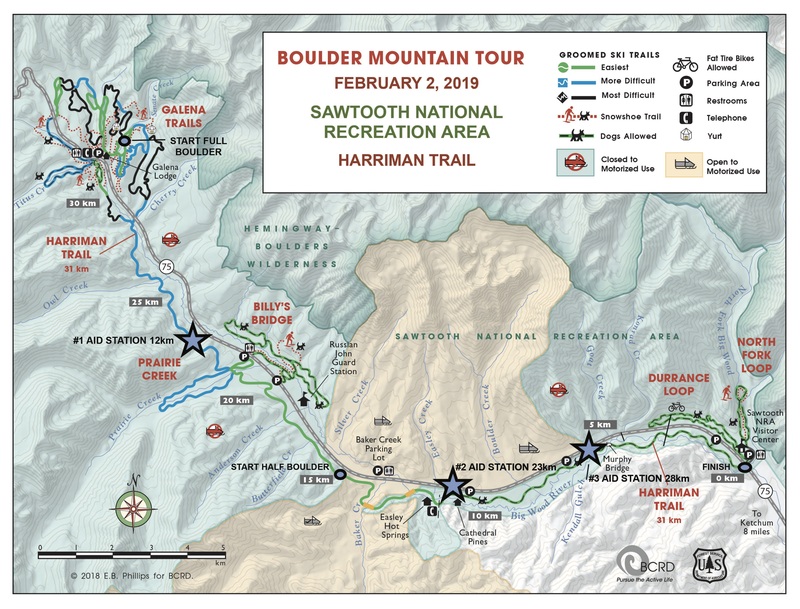 The course will be open for inspection on Friday, February 1 until 4 p.m. A BOULDER PASS will be required on the trails. Present your 2019 BMT and Half BMT race entry at any of the following local merchants and receive a BOULDER PASS, good for four FREE days of skiing (includes day of race). The BOULDER PASS will also be available at the BMT Expo and Race Bag pick-up. Look for the Blaine County Recreation District (BCRD) table.